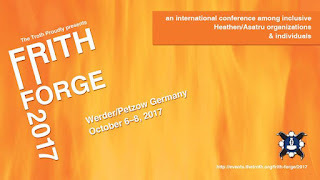 Frith Forge is the space and time on an international level to build alliances, understanding, and friendships among us instead of compartmentalizing further in an industrialized world. Lets learn from each other with respect for one another, and in frith instead of in isolation. Together we can enjoy this opportunity to discuss inclusion in religion and to promote cultural, religious, and educational exchange. 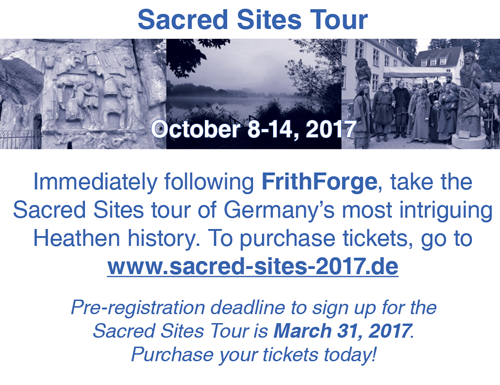 There will be a strong Urglaawe presence at Frith Forge, and the Sacred Sites tour will visit locations in Germany that are very much of interest to the Urglaawe communities. Early arrivals may join us for unstructured meet and greet time starting October 5th. The conference is immediately followed by the Sacred Sites of Germany tour, which runs from October 8-14, 2017. Pre-registration is underway between now and March 31 for the tour. The conference and the tour are separate (but related) events, so you may participate in one, the other, or both!